I'm considering having my "00" boxster re painted. The color of the car is black, I'm the second owner. Just purchased it. I can see numerous tiny scrathes and some paint chips. I tried the Klasse kit but I think it needs a new coat of paint. Can anyone recommend a "GOOD" paint shop? I would recommend that you go to a professional detail shop and ask them what they can do for you. You would be surprised what a good wet sanding and buffing can do for you finish. This will be expensive, but compared to a quality respray, we are talking about saving thousands of dollars. At best, you may be able to get away with respraying the front bumper and perhaps the hood. The rest might be savable. If you decide to respray, repost as their is a whole set of advice on that path. What's a qualitly respray cost these days?? I'm thinking 5k or more. That's probabbly at least 20% of the cars value....ouch. 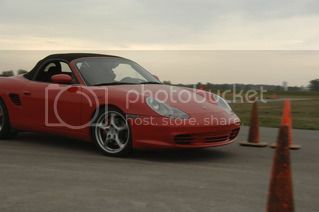 For that kind of scratch I would sell the current 00 boxster and buy one that is mint and possibly newer. Or, just live with it and keep buffing. Last edited by Adam; 04-04-2005 at 07:21 AM. Yes, you are right about the costs. Might be lower for a Box as it is small and the amount of prep work is much lower than on a sedan etc. About 7 years ago my father bought a 66' stingray and restored it. He took it to a local paint shop in our little podunk town and the cost was around 4,000 dollars. So I was basing my guessitment mainly on that figure since it is a smaller roadster like the boxster. Taking inflation and the "it's a Porsche so we'll charge more factor" in account, 5k is probably not too far off. He could spend more or less depending on where he goes. I would strongly recommend that you see about having a detail shop rehab your existing paint. Even a perfect aftermarket paint job will not have the durability and quality of your stock paint - the factory has access to equipment and processes way beyond what any paint shop can afford. I've driven repainted cars before, and they're very vulnerable to rock chips and other damage. Plus, you don't want to have your car taken apart and put back together, you'll get overspray and other issues, and it'll hurt your long-term value. A good detail shop will be able to take out even major scratches and swirls, and small dings are better touched-up. It is the rock chips that will get you. The hood is very vulnerable to chips in the paint, which no detail shop can handle. Unless the car has deep scratches, I would concur with avoiding a respray on the rest of the car. For example, if you have been keyed, you are toast. On the hood and front bumper, it may be the only way to rehab the finish to an acceptable level. If you can wait on this, I'd recommend seeking advice/instruction from the folks at the spring detailing event mentioned by Rey . You'd be amazed what can be done with the right products/equipment/experience. If past history is a guide, there should be plenty of all 3 at the event. Klasse is great, but surface prep beforehand is very important. Thanks for the feedback. I decided to wait. I did buy the Klasse Kit but you all know how the color Black can be so difficult and plus I am being very picky well.